A vast area taking in 12 ‘departments’. From west to east: Loire-Atlantique (depart. number 44 – capital Nantes), Vendée (85 – La Roche-sur-Yon), Deux-Sèvres (79 – Niort), Maine-et-Loire (49 – Angers), Sarthe (72 – Le Mans), Indre-et-Loire (37 - Tours), Vienne (86 – Poitiers), Indre (36 – Châteauroux), which is shaped like a vine leaf; Loir-et-Cher (41 – Blois), Loiret (45 – Orléans), Cher (18 – Bourges) and Nièvre (58 – Nevers). Vines owe their existence in this area to Saint-Martin, who founded Marmoutier Abbey and was the Bishop of Tours around 380. It was the Loire, as an important waterway, that played a key role in wine exports and vineyard expansion. With its variety of grapes, the Loire Valley makes all wine styles: reds (Bourgueil), sweet or dessert wines (Coteaux-du-Layon, Bonnezeaux, Montlouis) and fizz (Saumur, Vouvray, Montlouis). From Angers to Orléans, 280 km of the Loire are listed as Unesco World Heritage Sites. The Nantes weather is strongly influenced by the ocean with high rainfall. 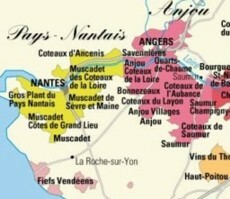 Appellation areas: Muscadet (Melon de Bourgogne or Muscadet variety), Muscadet-Sèvre-et-Maine, Coteaux-d'Ancenis. Muscadet is one of the best matches for seafood. The maritime climate is less marked as you head east. 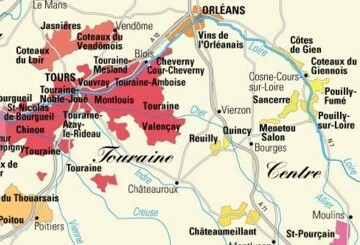 The Touraine vineyards (Indre-et-Loire and Loir-et-Cher departments/regions) go from Bourgueil to Valencay and include the Sologne area. Appellation areas: bourgueil, saint-nicolas-de-bourgueil, chinon, touraine-azay-le-rideau, jasnières (white wine made from Chenin Blanc, the closest vineyards to Le mans which explains why they go well with ‘rillettes’, a fatty pork terrine), coteaux-du-vendomois, cour-cheverny and cheverny in Sologne made from the romorantin grape), touraine-mesland, touraine-amboise, touraine-noble-joué, vouvray, montlouis, touraine, valencay. With a slight maritime influence, winters are harsher. The Central Vineyards have a continental climate: colder winters and hotter summers. King of grape varieties, Sauvignon Blanc rules in the appellation areas of sancerre (which goes well with the local goats’ cheese), pouilly-sur-loire (pouilly-fumé also from sauvignon), menetou-salon, quincy, reuilly. Bureau Interprofessionnel des Vins du Centre – umbrella trade association for the Central wine regions: sancerre, menetou-salon, quincy, Reuilly, coteaux-du-giennois, chateaumeillant, pouilly-fumé and pouilly-sur-loire. Also vins de pays du Jardin de la France (literally ‘Garden of France country wines’), Coteaux du Cher and Arnon, Coteaux Charitois, Coteaux de Tannay.